The oasis on wooden floor can be found in the lido #Türlersee, directly on the lake, surrounded by reeds and overlooking the water. #Relax body, mind and soul and recharge your energies. Due to the power of the special nature reserve with the living animals and plants, as well as the fresh sea air at the Türlersee, the effect of the energy work increases. #Peacefulness, #balance and life energy are strengthened and harmonized. Reiki in combination with Polarity or individually. AuraSoma Light Therapy with Lightbeamer can be used on request in Reiki and Polarity. If an appointment can not take place due to weather conditions, you can instead use your appointment in my Reiki #School & #Health Clinic in Affoltern am Albis or we postpone it. In the spirit of nature. 60 and 90 minutes treatments are possible in combination with Polarity. Prices in brackets: Subscriptions and camping guests receive 10% on the normal prices. Reiki courses, workshops treatments, sharing circles, Meditation etc. I am writing in respect of Yvette Plimmer in connection with her application for full membership within the UK Reiki Alliance. Yvette has been studying with me for just under a year during which time she has completed first and second degree and is due to take her master Practitioner level. When Yvette took her first degree, it was like „going home“ for her. She made an instant connection and started giving treatments straight away. It wasn’t very long before she took her second degree and hasn’t looked back. I understand she now has a thriving Reiki clinic and I often hear about the wonderful things she is doing for people. I am also impressed that Yvette really takes the time to understand Reiki. Yvette hast also been involved in organising a distance healing group for a 3 year old girl in need of a liver transplant. Through her efforts a group of 20 people came together to send energy to the little girl and her family, all for their highest good. The child has now received her liver and is doing well and her family have taken great comfort from our work.I would therefore fully support her application for full membership and believe that the UK Reiki Alliance would benefit from having Yvette as a member. Recently a client asked me if I knew of any instances where Reiki had helped infertility. I answered as a matter of fact I do know of one case. I had a student in my class last March who had undergone treatment for infertility taking medications without positive results. She had nearly given up on the idea of having a child. During her Reiki I and II weekend she remarked to the others in the class that she had felt something ‚pop‘ in her lower abdomen. Approximately 6 weeks after the class I received an email from her that she had become pregnant after she returned from her Reiki training weekend. She delivered a healthy baby last November. In another situation I had a client who was four months pregnant when she decided to take a Reiki I workshop. During her attunement, Tonya experienced the baby responding to the energy flow. As her pregnancy progressed she gave ‚Noah‘ reiki treatments. After his birth he was nicknamed the ‚Reiki Baby‘, as he was so relaxed and contented. Tonya says that on many occasions it appears that Noah reaches out to exchange Reiki energy with her and others. She has also used Reiki to help him through teething, childhood falls, and illnesses. Another Reiki client of mine heard about the positive benefits of having a ‚Reiki Baby‘ and decided to take a Reiki I and II workshop after she found out she was pregnant. The week of the class, Victoria was told that she was carrying twins. After becoming a Reiki Practitioner, Victoria gave her ‚boys‘ a Reiki treatment every day. She was able to carry the twins almost to full term and reports that they are easy to care for, whenever they are fussy she gives them Reiki and they calm down. I had a student this past summer question me about a statement she had read in a book on Reiki which said that Reiki should never be given to a women late in her pregnancy. She asked for my reaction to the statement. I told her I expected it came from the thought that the Reiki energy might cause labor to prematurely start. I did not believe that to be true because I knew from my private practice and from my students that Reiki had only benefited them during their pregnancy. I also believe very strongly that ‚Reiki can never cause harm‘ and is appropriate for all situations, therefore can be used at any point in the pregnancy for the highest good. There is a differing opinion among Reiki Masters regarding the unborn baby receiving an attunement to the Reiki energy. Some feel that as the mother is being attuned the baby is also being attuned to Reiki. Others disagree, saying that the baby is in no way part of the attunement process. I personally feel that since the baby is part of the mother’s energy system during the attunement process he/she receives the benefit of the attunement. There is a connection or bond between the baby and Reiki. Does this mean that the baby is a Reiki Practitioner, only spirit knows the answer to that question? I do know that ‚Reiki Babies‘ seem to respond to the world around them differently than other babies. I realize that there is no controlled scientific study in these cases, however there is certainly evidence that the use of Reiki before, during, and after pregnancy has positive results both for the mother and baby. My daughter, Wayles (who is a Reiki Master), and I have talked about her future pregnancies. There is no question, she will be receiving a Reiki attunement during her pregnancy and will use the Reiki daily during pregnancy for the health and contentment of her baby and herself. Beth Simmons Stapor, PhD is a Center Licensed Reiki Master Teacher, and makes her home in Cookeville, Tennessee. For classes taught by Beth see the class schedule. Reiki (pronounced Ray-Key) is a unique touch healing method and means universal life energy. Reiki originated in Japan at the end of the 19th century and it is since practised all over the world. Reiki means: universal (-rei) and life energy (-ki). It is a system of energy healing, using spirituallity guided unversal life force energy and it is a also a useful tool for self-awareness and transformation. Reiki is a safe, gentle, non-invasive form of hands-on healing that increases energy, reduces pain, produces deep relaxation and a general feeling of well-being. Reiki takes effect on all levels, body, mind, spirit and soul. By stimulating the body’s natural healing ability at the deepest level, it removes physical and emotional blockages that may have been causing illness or upset for some time. Many different ailments can be cured or relieved by the healing energy. Problems such as headaches, back ache and stress-related illness, chronic illnesses, such as arthritis or asthma all respond well to energy treatment. Most times repeated treatments need to be required for an improvement to be seen. I’m placing my hands on or near your body in a series of hand positions. The client remains fully clothed. Dr. Mikao Usui, or Usui Sensei as he is called by his students in Japan, is the founder of the Usui System of Reiki. He was born August 15, 1865 in the village of Yago in the Yamagata district of Gifu prefecture, Japan. Usui Sensei had an avid interest in learning and worked hard at his studies. He traveled to Europe and China to further his education. His curriculum included medicine, psychology, and religion. It is thought that he was from a wealthy family, as in Japan only the wealthy could afford to send their children to school. Eventually he became the secretary to Pei Gotoushin, head of the department of health and welfare who later became the Mayor of Tokyo. The connections Usui Sensei made at this job helped him to become a successful businessman. He ended up spontaneously receiving Reiki during a a mystical experience on Mt. Kurama. In 1914 Usui’s personal and business life was failing. As a sensitive spiritualist, Usui Sensei had spent much time meditating at power spots on Mt. Kurama. So he decided to travel to this holy mountain, where he enrolled in Isyu Guo, a twenty-one-day training course. We do not know for certain what he was required to do during this training, but it is likely that fasting, meditation, chanting and prayers were part of the practice. In addition, we know there is a small waterfall on Mt. Kurama where even today people go to meditate. This meditation involves standing under the waterfall and allowing the waters to strike and flow over the top of the head, a practice which is said to activate the crown chakra. Japanese Reiki Masters think that Usui Sensei may have used this meditation as part of his practice. In any case, it was during the Isyu Guo training that the great Reiki energy entered his crown chakra. This greatly enhanced his healing abilities and he realized he had received a wonderful new gift – the ability to give healing to others without depleting his own energy! Up to this point, the Usui system of healing consisted of the energy itself, the symbols, the attunement process and the Reiki ideals. This was what Dr. Usui had received during his mystical experience on Mt. Kurama. 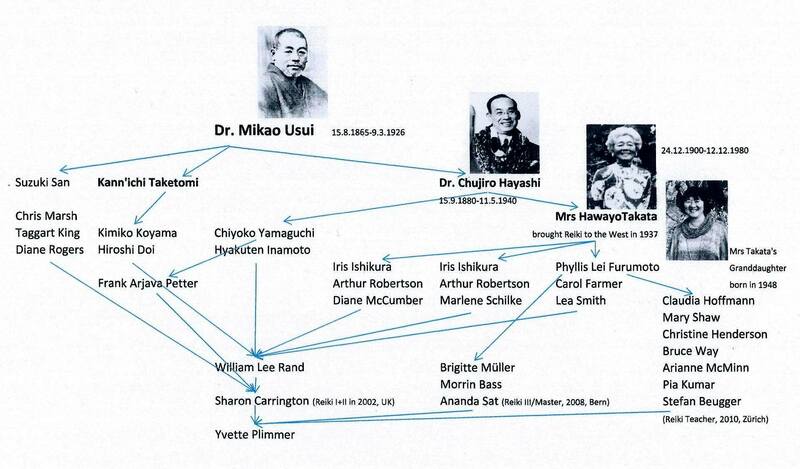 Dr. Hayashi went on to develop the Usui system of healing. He opened a Reiki clinic in Tokyo and kept detailed records of the treatments given. He used this information to create the standard hand positions, the system of three degrees and their initiation procedures. Reiki comes to the West. Hawayo Takata was born at dawn on December 24th, 1900, on the island of Kauai, Hawaii. Her parents were Japanese immigrants and her father worked in the sugar cane fields. She worked very hard as she was growing up. She eventually married the bookkeeper of the plantation where she was employed. His name was Saichi Takata and they had two daughters. In October of 1930, Saichi died at the age of thirty-four leaving Mrs. Takata to raise their two children. In order to provide for her family, she had to work very hard with little rest. After five years she developed severe abdominal pain, a lung condition and had a nervous breakdown. Soon after this, one of her sisters died and it was the responsibility of Hawayo to travel to Japan where her parents had moved to deliver the news. She also felt she could receive help for her health in Japan. She took a steamship and was accompanied by her sister-in-law. After informing her parents of the death of her sister, she entered a hospital. It was found that she had a tumor, gallstones and appendicitis. After resting several weeks, she was ready for the needed operation. On the operating table, just before the surgery was to begin, Hawayo heard a voice. The voice said, „The operation is not necessary. The operation is not necessary.“ She had never heard a voice speak to her like this before. She wondered what it meant. The voice repeated the message a third time even louder. She knew she was wide awake and had not imagined the voice. It was so unusual, yet so compelling that she decided to ask the doctor. She got off the operating table, wrapped a sheet around herself and asked to speak to the doctor. When the doctor finally came, she asked if he knew of any other way that her problems could be helped. The doctor knew of Dr. Hayashi’s Reiki clinic and told Hawayo about it. This was something she wanted to try. At the Reiki clinic, she began receiving treatments. She had never heard of Reiki before and did not know what it was. Using their Reiki hands the practitioners could sense what was wrong with Mrs. Takata. Their diagnosis very closely matched the doctor’s at the hospital. This impressed her and gave her confidence in what they were doing. Two Reiki practitioners would treat her each day. The heat from their hands was so strong that she thought they were using some kind of equipment. She looked around, but saw none. Seeing the large sleeves of the Japanese kimono one of the practitioners was wearing, she thought she had found the location of the equipment. She grabbed the sleeves, but found nothing. The startled practitioner wanted to know what she was doing and when she explained, he began to laugh. Then he told her about Reiki and how it worked. Mrs. Takata returned to Hawaii in 1937. She was soon followed by Dr. Hayashi and his daughter who came to help establish Reiki in Hawaii. In the Winter of 1938, Dr. Hayashi initiated Hawayo Takata as a Reiki Master. She was the thirteenth and last Reiki Master Dr. Hayashi initiated. Between 1970 and her transition on December 11, 1980, Mrs. Takata initiated twenty-two Reiki Masters. Below is a list of the Reiki Masters she initiated. The five spiritual principles of ReikiJust for today, do not worry.